Biography: Mary Dye has lived in the 9th District most of her life, where she operates a 3,000-acre wheat farm with her husband, Roger. They also tend to 3,000 sheep on the farm. The Dyes pride themselves on creativity and innovation in agronomic practices and advancing new technologies that improve efficiencies and cost savings for the agricultural community. She has been a lifelong advocate for causes that protect critical infrastructure and technology relating to agriculture, natural resources and transportation. Along with owning and managing a dryland wheat farm, she has served as a field consultant for Spectrum Crop Development, where she was responsible for developing technology to introduce canola production in eastern Washington crop rotations. She has a bachelor of science degree in plant science and crop management from the University of Idaho. She has also served as an agriculture educator for the Peace Corps in Thailand. Appointed to the Legislature in 2015, Mary’s goal is to work to advance solutions that make Washington state a better place to live, work and raise a family. One of her top priorities is supporting policies that provide economic opportunity for all Washingtonians and allow entrepreneurs to succeed. 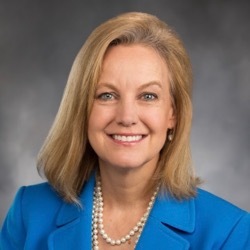 She is a vocal advocate for limited, but effective government, and believes state agencies at every level need to work more efficiently and effectively for all Washingtonians.